Between prepping trays of adorable skewered appetizers, keeping a watchful eye on the roasting turkey (or ham, or standing anything else you might be roasting) and getting that pie crust flaky AF, the last thing you want to worry about while hosting holiday gatherings is playing bartender to your guests. The solution? Prep a batch of seasonal punch before everyone arrives and you’ll have instant cocktails people can help themselves to all night long. Who knows, you might even get to relax for a few and throw back a cupful before the doorbell rings. Pro tip: As we’ve suggested in previous holiday entertaining articles, it is recommended to freeze a small bowl of ice water the night before for a giant cube that will evenly cool the drink for hours. If you need inspiration for which bottles to choose for your base spirits, you can’t go wrong with these medal winners of the NY International, Berlin International or Melbourne International Spirits Competitions. Punch Bowl Social just opened the newest location of its restaurant, bar and entertainment complex in Arlington, Virginia. The concept touts gaming areas, private karaoke rooms, a bocce court and lots of space for friends to gather—so naturally, shareable cocktails are part of the fun. This spicy bourbon punch is about as perfect as recipe gets for the holidays. Pour all ingredients except garnish into a punch bowl and add about half as much as ice as you’d need to fill it. Stir the punch with a ladle for a minute to properly mix and dilute it. Add ice to properly fill the bowl, and garnish with the orange wheels. Combine 1 cup sugar and 1 cup water in a small saucepan. Bring it to a boil, then simmer until sugar is dissolved. Remove the syrup from the heat and add 3 cinnamon sticks, 3 allspice berries, 3 cloves and the peel from a navel orange. Steep for 15 minutes or until desired flavor is achieved. Strain out solids, then store in the refrigerator for up to a week. The secret ingredient to this fresh and citrusy punch? Generous dashes of bitters that taste just like the baking spices in your favorite holiday pie. This recipe can be scaled for a larger crowd; just be sure to add the beer right before serving. In a pitcher, combine the sugar cubes and bitters with an ounce of club soda. Muddle and stir until well dissolved. Add gin, liqueur, juices, the rest of the soda, cinnamon and cloves. Fill pitcher halfway with ice and gently stir until well chilled. Strain into a punch bowl, but keep the cinnamon and the cloves in the liquid for 30 minutes before serving to properly steep. For individual pours, use a rocks glass with 1 large ice cube and top with 1 oz. of beer per cocktail. Garnish with plum slices. This sparkling cocktail gets a triple dose of tart berry flavor from ruby Port, cranberry juice and fresh cranberries, while white tea lends delicate floral notes. Feel free to make as large a batch as you need. Note: Since “part” is such a loose, indefinite measurement, we recommend starting with cups and tasting to finalize the measurements. This recipe serves a small crowd of 4 - 6, but you can expand it as needed. Combine all ingredients except the Prosecco and garnish in a punch bowl filled with it. Stir gently, add the Prosecco and garnish with the lemon twists and fresh cranberries. Founder Will Duncan says punch is better if you make it a day or two in advance so the flavors can meld. Lacking fridge space? “Mix everything in a bucket from Home Depot, seal it up and put in the backyard in the snow to keep it cold; it will be ready the day of your party.” And continuing with the ice block idea, he suggests make a more festive versi by freezing water and seasonal fruit and herbs in a plastic container, which will melt more slowly and cool drinks without diluting them. In a punch bowl, prepare an oleo saccharum (citrus sugar) by muddling the sugar, honey and lemon peels every 15 minutes for 45 minutes. Add the hot tea to the mixture, stirring until dissolved. Add the gin, Besk, poire liqueur, lemon juice and pear juice. Add ice and stir briefly to chill. Finish with soda water and garnish with the rosemary and pear skewers. The craft apple brandy that goes into this punch is aged in bourbon barrels and sherry casks. 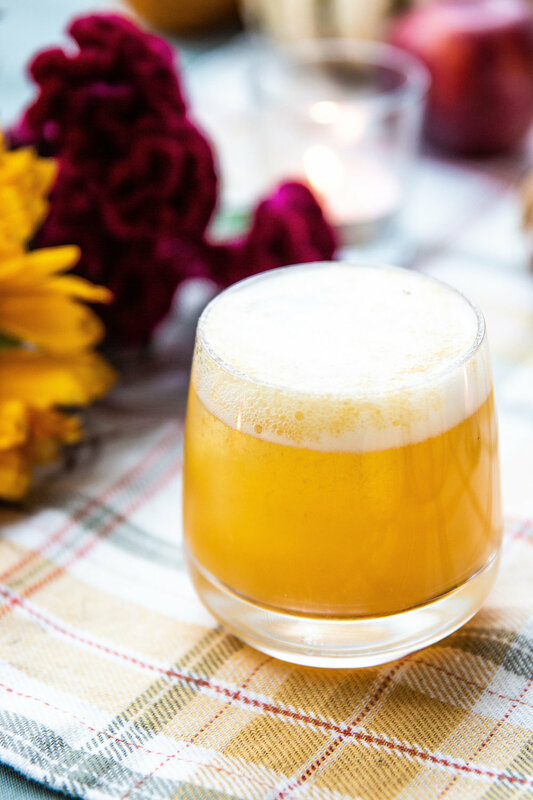 Its notes of butterscotch, caramel and baked apple are perfect in this punch which balances spicy, sweet, citrus and apple flavors. You can make dried lemon peels by baking them at a low temp in the oven or using a dehydrator. Stir all ingredients together in a punch bowl over a block of ice, and garnish with the dried lemon wheels and star anise pods. This punch was inspired by one of founder Jennie Ripps’ favorite beverages, Campari, which she especially loves around the holidays. It can also be served hot—just skip the chilling stage. In a large saucepan, bring the water to a boil then remove from the heat. Place mulling spices, hibiscus, lemon peels and orange peels into the water and allow it to steep for 10 to 15 minutes, stirring occasionally. Strain out solids and pour liquid into a different large saucepan. Add sugar and stir until dissolved. Chill for 2 hours, then add spiced rum and Campari. Serve in punch bowl with sliced orange and cinnamon sticks.